The following story is from my WUSF Public Radio colleague Julio Ochoa. But on the pills, Claybaker went from a highly-trained fighting machine to a zombie for at least two hours a day. “I mean, I’m talking mouth open, staring into space,” Claybaker said. Claybaker decided he would rather live in constant pain. He took himself off opioids and endured the discomfort for eight months. Then, after retiring and moving back to St. Petersburg, he discovered marijuana – and it changed his life. Marijuana instantly relieved his pain and helped with his anxiety. Claybaker says marijuana also helped him focus and he finally started feeling more like himself. In order to get the drug, though, he had to break the law. Even with medicinal marijuana legal in Florida, the federal government says it’s a crime. Claybaker and other soldiers can’t get a prescription from the VA and their insurance won’t cover it. The out-of-pocket costs to buy a month’s supply from a dispensary can be upwards of $500. Claybaker was featured in a 20-page report by the Sarasota Herald-Tribune about veterans who want the government to reclassify marijuana to reflect its medical value. The vets are using the drug to treat conditions ranging from pain to PTSD. Reclassifying marijuana from a schedule 1 drug – which has no medical value – would open doors to research and treatment at the VA.
Janine Lutz, who was also featured in the Herald-Tribune’s report, joined the effort after her son committed suicide in 2013. “The drugs killed my son,” Lutz said. 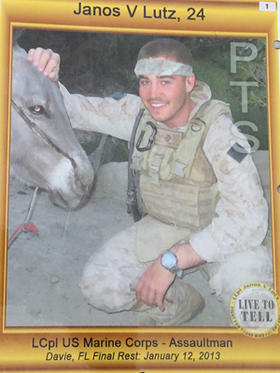 Janos (John) V. Lutz was a Lance Corporal in the Marine Corps who served two tours in Iraq and Afghanistan. He returned home to Davie in 2011 with injuries to his knee and back and a severe case of PTSD. Doctors at the VA prescribed an anti-anxiety medication, despite a note in his records that it had led to a previous suicide attempt. His mom says he was dead within a week. 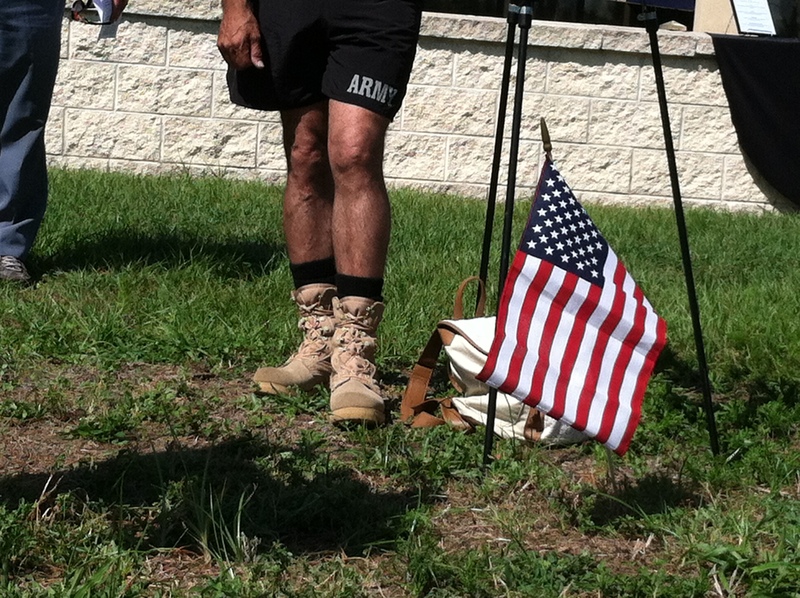 Today Lutz runs the Live To Tell Foundation, which supports military veterans. Families of vets who committed suicide send her their photos, which she laminates and links to her traveling Memorial Wall. Her “Buddy Up” events bring veterans together so they can form bonds and look out for one another. It was at those events that she learned how many veterans self-medicate with marijuana. With about 20 veterans committing suicide every day in the United States, Lutz says the government needs to act. “Stop playing games with the lives of America’s sons and daughters and if they want cannabis, give it to them and stop giving them these psychotropic dangerous drugs that are destroying their bodies and their minds,” Lutz said. The American Legion polled its 2 million members – war veterans – and found that 92 percent favored marijuana research. In addition, 22 percent reported using marijuana for medical reasons. At a recent stop in Orlando, new VA Secretary Robert Wilkie said he has got to follow the rules. Charles Claybaker says he and other soldiers deserve better. Claybaker started speaking out after a good friend and fellow ranger committed suicide. “I think that the government owes it to the veteran to provide the most beneficial treatments for their injuries,” he said. Marijuana, he said, helps him get through the dark times. He thinks it can help others too. The radio version of this story is available here. Army veteran Phillip Faustman sifts through his belongings at a San Diego homeless shelter. Faustman says he attempted suicide three times in two and a half years. The following is a report from Steve Walsh, my colleague at the American Homefront Project, reporting on military life and veterans issues. The Veterans Health Administration is planning to make mental health care more available to help reduce veteran suicide. But veterans advocates worry about the impact on the already strained VA health system. A recent government study concluded that the majority of veterans who commit suicide are not enrolled in VA mental health care. Phillip Faustman almost became a part of that statistic. Faustman, who is gay, joined the Army in 2012 after the end of the “Don’t ask, Don’t tell” policy, which barred gay and lesbian troops from serving openly in the military. “I waited for the repeal, so I joined the Army to prove to myself that I could do it,” he said. While in the military, he suffered sexual trauma that led to a diagnosis of post-traumatic stress disorder and depression. Discouraged, he left the military in 2015, he said. Periodically homeless, Faustman did not turn to the VA, in part because he found the enrollment process daunting. That’s a common problem among new veterans, only forty percent of whom receive VA mental health coverage. Many are discouraged from seeking care because of a complicated process to determine their eligibility. Veterans may have to prove, for instance, that their mental health need is connected to their service. This is the third year the American Legion Post 5, 3810 W. Kennedy Blvd, Tampa, is reaching out to family members and friends who have lost a veteran or military member to suicide. The hope is to give an opportunity to remember loved ones, to honor their service to the country and to erase the stigma surrounding service members who have died by suicide. “This event and message will focus on family members and friends who silently suffer the lost of their loved one to their battle with their inner demons,” stated Ellsworth “Tony” Williams, a retired Army combat veteran and chair of the American Legion Florida 15th District Veteran Affairs and Rehab. The ceremony is Sunday, May 21, 2017 at 1 p.m. at Post 5, 3810 W. Kennedy Blvd., Tampa, FL. After releasing a summary in early July, the Department of Veterans Affairs today released its full report on veteran suicides. The Suicide Among Veterans and Other Americans 2001-2014 is a comprehensive analysis that looked at more than 55 million veterans’ records from 1979 to 2014 from every state in the nation. In 2014, an average of 20 veterans died by suicide each day. Six of the 20 were users of the VA Health services. In 2014, veterans accounted for 18 percent of all adult deaths by suicide in the U.S. but only make up 8.5 percent of the population age 18 or older. In 2014, about 67 percent of all suicides by veterans a firearm was used. Approximately 65 percent of all veterans who died from suicide in 2014 were 50 years of age or older. Since 2001, U.S. adult civilian suicides increased 23 percent, while Veteran suicides increased 32 percent in the same time period. After controlling for age and gender, this makes the risk of suicide 21 percent greater for Veterans. A fact sheet is available and the VA is taking several measures to increase prevention programs and access to care and the Veterans Crisis Line: 800-273-8255. 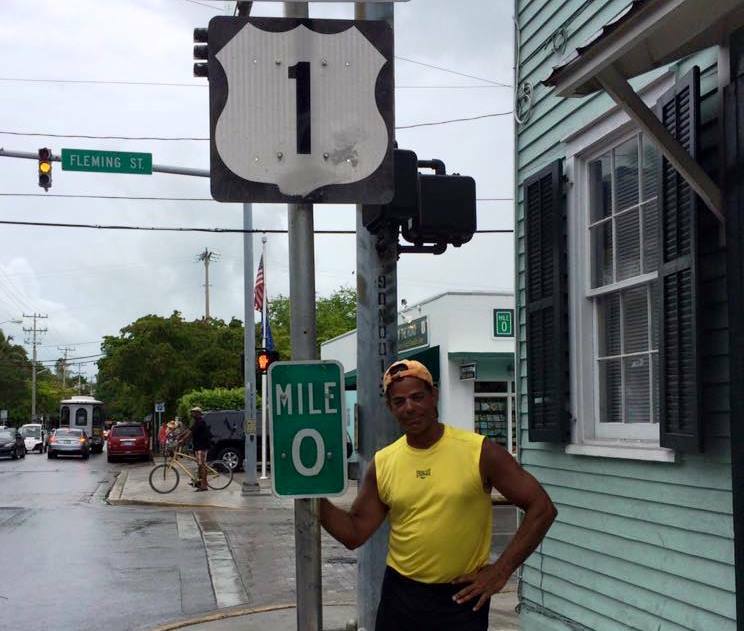 Alex Estrella reached to 0 mile marker of US 1 in Key West on Tuesday at 1:30 p.m. after running and walking 405 miles from Tampa. Photo by Monica Kim. Alex Estrella, a former Army Ranger and Gulf War veteran, achieved his goal running 405 miles from the main gate at MacDill Air Force Base to Key West. He optimistically hoped to complete the personal challenge in eight days. However, it took more than 12 days to reach the 0-mile marker on U.S. 1 which happened Tuesday at 1:30 p.m. But his mission was about more than mileage. He wanted to honor Air Force Reserve Capt. 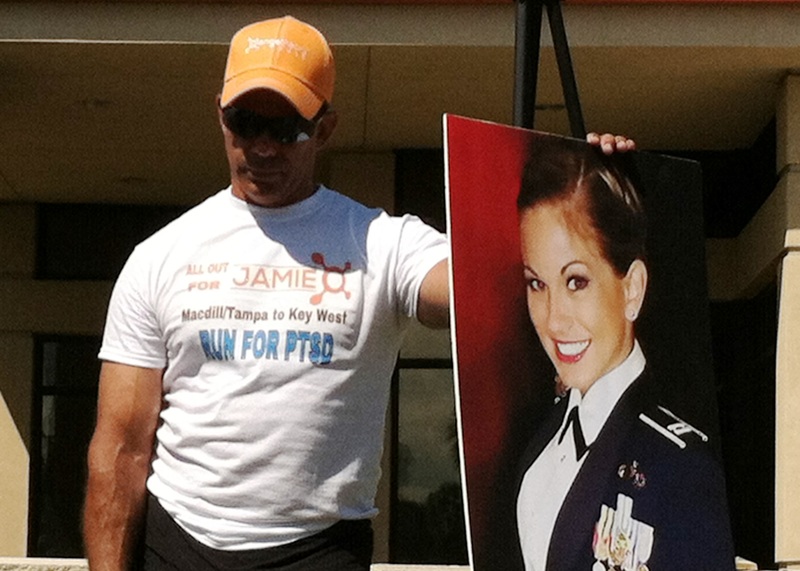 Jamie Brunette, also of Tampa, who committed suicide in February and to raise awareness of veteran suicide and PTSD. In addition, Estrella wanted to raise the visibility of two organizations helping veterans, Hope for the Warriors, a non-profit organization that provides veterans services, and the Elk Institute for Psychological Health and Performance where veterans and active-duty military can obtain free help with PTSD. Veterans can get help by calling the Veterans Crisis Line at 800-273-8255, go online to chat live or text message to 838255. Jamie Brunette, an Air Force Reserve captain and Afghanistan War veteran, killed herself in her car February 9, 2015 in Tampa. Photo courtesy of Jamie Brunette Facebook. Air Force Reserve Captain Jamie Brunette is described by friends as a vivacious athlete with a huge smile who loved people and loved to run. Malia Spranger, an Air Force Reserve colonel, served with Brunette, was her friend and business partner. They were going to open a fitness center together in March. 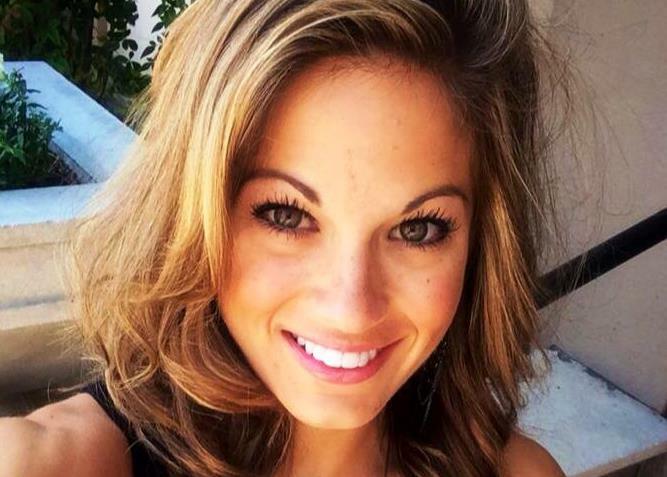 But Brunette, an Afghanistan War veteran, took her own life February 9, 2015. Jamie’s “raspy laugh” is what her roommate, Heather Milner, misses most. “The way I remember Jamie is being super goofy. She was always dancing around and smiling and laughing. Like, every day was always a good day,” Milner said. Gulf War veteran and former Ranger Alex Estrella holds onto the photo of Jamie at the kick-off ceremony outside MacDill Air Force Base’s main gate for his 405-mile run to Key West. 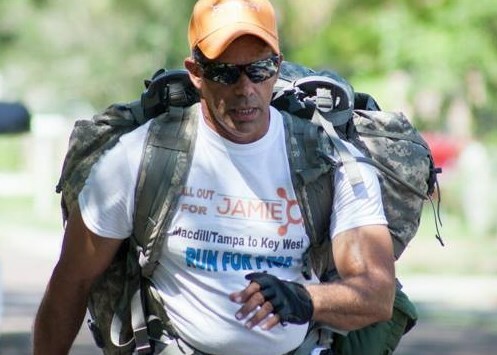 The solo run from Tampa to Key West was the idea of former Army Ranger and Gulf War veteran Alex Estrella, 56. Although the Tampa resident never met the promising young airman, Brunette’s suicide inspired him to do the 405-mile run to honor her, raise awareness about veteran suicide and post-traumatic stress. Wearing combat boots, a 40-pound rucksack and escorted by Tampa Police volunteers, Estrella left MacDill hoping to make it to Key West in eight days. Within a few miles, the 90 degree temperatures forced him to change into running shoes and shed the rucksack. Checking in with Estrella at the eight-day mark found him walking alone on Tamiami Trail about to turn south to Homestead just over halfway to his goal. Hampered by the heat, blisters and cramping muscles, Estrella chuckled when asked if he considered abandoning his quest. “I have 22 reasons why not to give up and those of course are the 22 vets a day that take their lives,” Estrella said. Alex Estrella wore combat boots for the first few miles of his run but blisters forced him to switch to running shoes. According to the Veterans Administration, 22 veterans on average commit suicide every day. And that number only reflects those in the VA system. Those who have never used VA, along with active-duty military, reservists and National Guard are not included. Despite his first chase vehicle having to turn back and getting only a couple of hours rest each night, Estrella continues. Midday Thursday, he optimistically estimated that he will reach Key West on Sunday, May 31, 2015. In addition to honoring Brunette, Estrella also hopes to raise the visibility of two organizations helping veterans, Hope for the Warriors and the Elk Institute for Psychological Health and Performance. 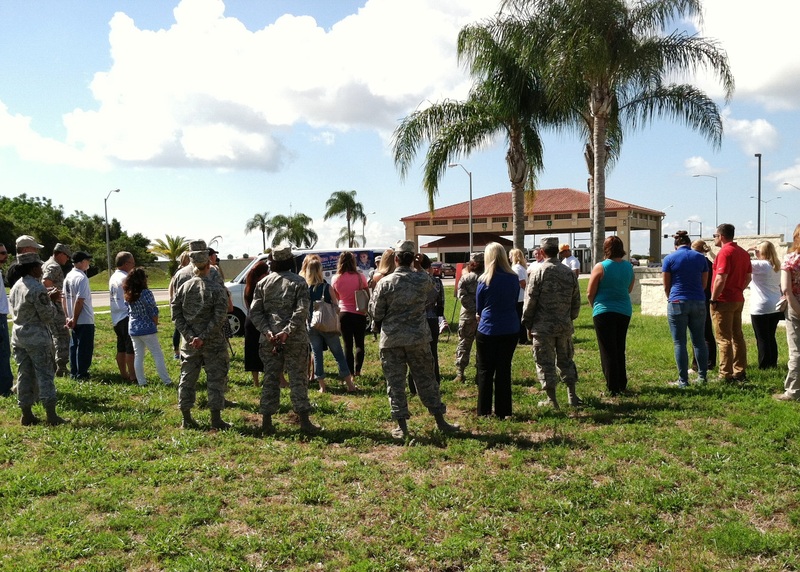 A couple dozen friends, airmen and veterans turned out for the start of The Run for Jamie just outside the main gate at MacDill Air Force Base, Tampa, on May 21, 2015.